Goodness of jamun (Indian Blackcurrant/ Black Plum), bananas, topped with millet muesli, yogurt, apples and kiwis, seeds and coconut flakes. A hearty, healthy breakfast indeed! By now my love for smoothie bowls must be obvious! I find them extremely easy to whip up, and what is more, they’re versatile as crazy – you can choose from plethora of base and toppings. Blend your choice of vegetables and fruits for the base, add seasonal fruits and healthy seeds and nuts for topping. 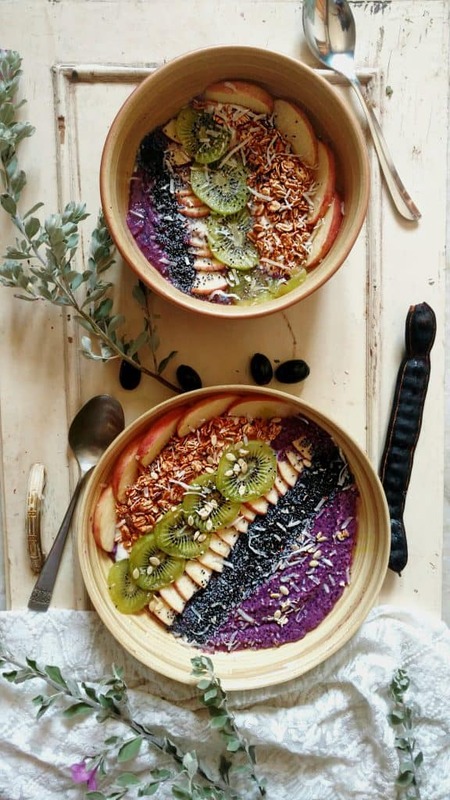 This 2-step formula never changes and can yield such beautiful and tasty smoothie bowls, every time you try it. 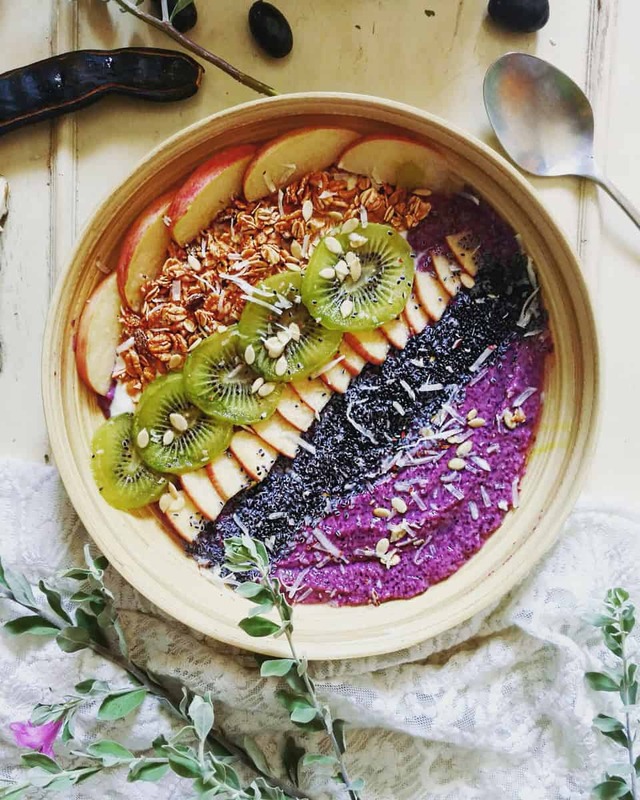 Smoothie bowls are a great choice for breakfast or even if you wish to replace a full-fledged meal with it, because by managing the macronutrients and micronutrients, you get a balanced meal in the end. Plus side, smoothies have their fiber content intact, which is what makes these better than any other meal or snack option that has less dietary fiber content. Every time I spot Jamun or Indian blackcurrants being sold on fruit stalls, it brings back wonderful childhood memories where fruit-picking from the huge Jamun tree in the backyard at a cousin’s house was one of our favorite pastimes. I stock up on them as soon as they appear, and the idea of making a smoothie out of them flashed in my head mostly for the beautiful purple color it would render. Jamun is a low-calorie (carbohydrates – 14gm), low- Glycemic Index fruit, full of polyphenolic compounds that render it to be a miracle when it comes to keeping diabetes at bay, since it expertly absorbs the additional blood sugar, creating a hypoglycemic effect. It is also rich in Iron (30mg), Calcium (15mg), Vitamin C (18mg), Carotene (48mg) and Potassium (55mg)*. *All values for 100 grams of Jamun fruit. I mixed jamun with bananas to bring up the carbohydrate content, along with the addition of essential macronutrients and micronutrients. The result was a smooth, tasty base with a beautiful purple color. Blend frozen Jamun and bananas to a smooth consistency. Divide into 2 bowls. Spread the yogurt in a corner and top with millet muesli. Top with sliced fruits, seeds, and sprinkle coconut flakes at the end. For de-seeding or pitting the Jamun fruits, remove the skin and pulp in small sections with a paring knife and force the seed out. Be careful not to scrape the seed, as it will make the puree bitter-tasting. Freeze after pitting. This recipe is very versatile – you can add any toppings as per choice and availability.